In large resealable food-storage plastic bag, mix flour, bouillon, poultry seasoning and pepper. Add chicken thighs, potatoes and onion; seal bag and shake to coat. In 3 1/2- to 4-quart slow cooker, place chicken and vegetables. In small bowl, mix tomato sauce and Worcestershire sauce. Pour over chicken and vegetables; stir gently. 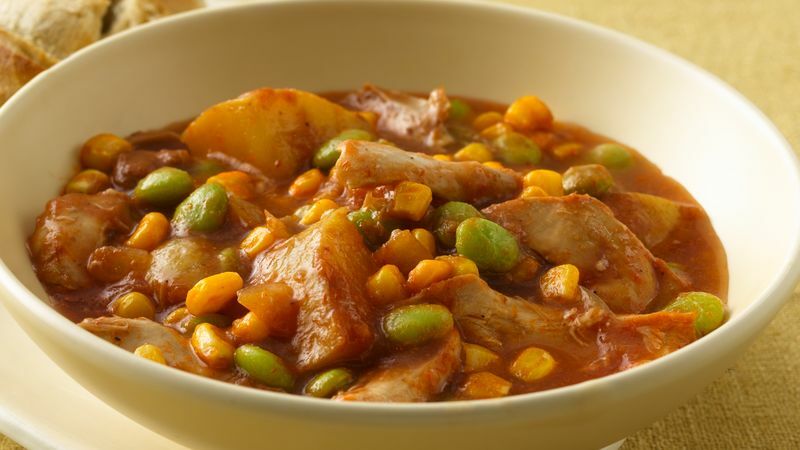 Stir lima beans and corn into stew. Cover; cook about 30 minutes longer or until beans and corn are tender. With slotted spoon, remove chicken from slow cooker. Remove chicken from bones; discard bones. Cut chicken into pieces; return chicken to stew. Add salt and pepper to taste. Use a 10-ounce bag of frozen shelled edamame, thawed, for the lima beans. This bright green soybean is packed with nutrients.